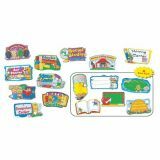 This mini bulletin board set and more includes: reproducible badge and bookmark patterns; 10 center signs, largest approx. 11 inches x 5.5 inches; 6 blank center signs; and a resource guide. 16 pieces. Beautiful full color padded passe with plenty of writing space. 6 1/2" x 4". 50 per pack.